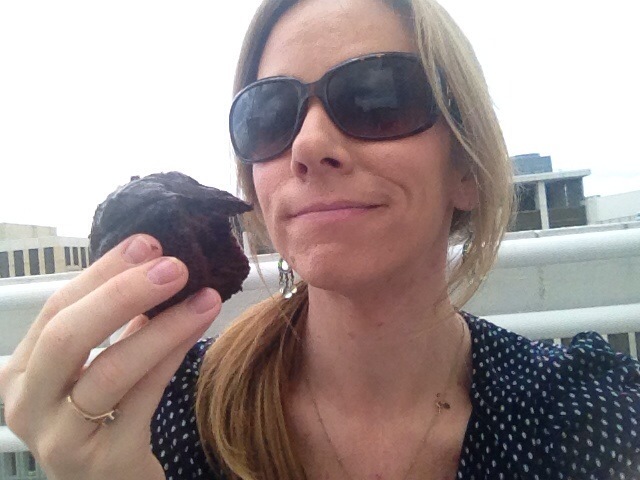 Double chocolate cupcake on the roof last Thursday. Because whatever! After two weeks on the new job in DC, I realized I had a huge problem: I was eating out waaaaay too often. Every day, I was leaving the office between 12 and 1 to scout the local salad, sandwich, and pasta/pizza scene for something cheap and healthy to eat. My selections ranged from clam chowder on a rainy, gloomy day to a lobster salad with wheat berries, spinach, and onions (I could not resist…) to a shrimp and avocado salad with a double chocolate cupcake for dessert. It wasn’t always healthy or cheap. But things still felt kind of unfamiliar to me at the office and with my new routine, so I felt like I needed the flexibility of “where should I go to grab something?” instead of being the new girl who eats weird things. Luckily, after one of my new colleagues suggested all the girls in the office have lunch on the rooftop this past Friday afternoon to which she brought a very healthy lunch of fresh berries in vanilla yogurt and a super earthy power salad in real dishware and not Tupperware, I finally felt safe enough to let my own freak flag fly. So, I am back to making my own lunches. One thing I always need as part of my lunch is a sweet tooth fix. Finding something that is chocolate-y and healthy can sometimes be a challenge. If you make a chocolate baked good, you have to have all the other ingredients that make up the baked good. Dark chocolate is obviously the healthy choice, but if it’s too dark, it’s like eating tar. Hot chocolate and chocolate milk are other options, but more often than not, they are too sugary or processed to be a healthy alternative. Enter chocolate bark. Chocolate barks are wonderful dessert creations. Aside from being so easy a dude could make it, you have the benefit of mixing pretty much whatever you want into melted chocolate and letting it cool so you can break it off into pieces. Since I had a bag of walnuts on hand from my move (again, not wasting food, so yes, I did pack it from Nebraska) and knew from the days of my making my own trail mix that dried blueberries are the WBNA of dried fruits, I decided to make a Blueberry and Walnut Dark Chocolate Bark and added loads of sea salt to make it a delicious and savory treat. 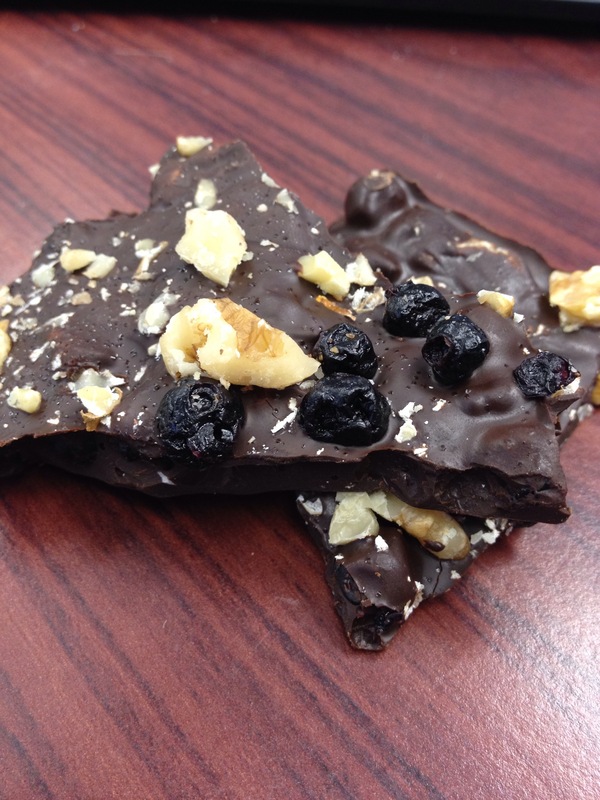 Hence, Salted Blueberry and Walnut Dark Chocolate Bark. 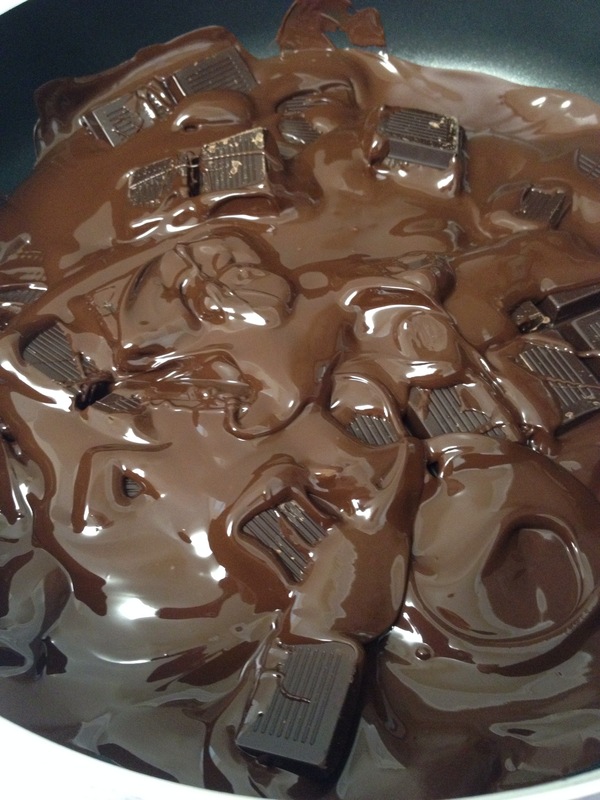 You get going by melting the dark chocolate in a fairly large saucepan. This can be a little terrifying if you have a gas stove, like I do, so if it works better for you to use a bowl in the microwave, be my guest. While the chocolate is melting, I chopped the walnuts and separated large chunks of blueberries in the bag. I also lined a baking sheet with wax paper. Once the chocolate had melted pretty much all the way, I dumped the blueberries and walnuts into the mixture and salted the heck out of it. Use your own judgment for this part: if you’re using actual sea salt, be careful not to over-salt it because the grains are bigger, but if you just have table salt, just make sure the mixture doesn’t look like the first snow of the season and you’re good. Once everything has mixed in sufficiently, grab a spatula and pour the mixture over the wax-papered baking sheet. Smooth out the mixture on the wax paper, ensuring that there are no “thin” spots or empty spaces. Use the remaining blueberries and walnuts to sprinkle over the top of the mixture and give the whole thing another shake with the salt. Finally, set it in the fridge for about 2 hours (or the freezer if you’re in a hurry) to cool off and harden. When the mixture has hardened all the way (don’t jump the gun on this– I did that before it was cooled all the way and the chocolate was still soft and melted all over my fingers), break it off into pieces and store in a container in the fridge. Voila! A healthy dessert that still isn’t a wolf in sheep’s clothing. By my best estimates, the dessert makes about 15 servings which comes out to 335 calories with 21g of fat (8.5 saturated) and 14.7g of sugar per serving. There are probably ways to cut down the calorie count– try choosing a different brand of dark chocolate, for example– and make sure to choose unsweetened berries to avoid added sugar and calories. On the upside, this dessert also packs about 7.5g fiber and 5g of protein, not to mention a truckload of antioxidants with the dark chocolate. Probably can’t get that in a baked good! In addition, for all the ingredients, I probably spent about $13.97, or $.93 per serving. All things considered, Snickers has nothing on this savory chocolate fix. IMHO, the sweet tooth cravings are genetically programmed into our family. I “blame” it on the Schmoker side. Glaring example: Uncle Stephen = a pocket full of candy. Always. Next Next post: Chicago Marathon Training: Week….Where am I?…..